Caracas has a tropical climate. 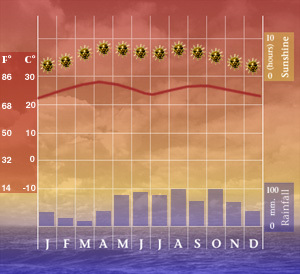 Summer temperatures range between 18Â°C and 29Â°C (64Â°F and 84Â°F) and winter temperatures between 16Â°C and 27Â°C (60Â°F and 81Â°F). The dry season runs from December to April and the rainy season from May to November.